J.F. Riordan and B.L. Vallee, Preparation of Metal-Free Water. B. Holmquist, Elimination of Adventitious Metals. D.S. Auld, Metal-Free Dialysis Tubing. M.T. Martin, Metal-Free Chromatographic Media. F.W. Wagner, Preparation of Metal-Free Enzymes. C. Veillon, Standards for Metal Analysis. D.S. Auld, Methods for Metal Substitution. W. Maret and M. Zeppezauer, Preparation of Metal-Hybrid Enzymes. H.E. Van Wart, Introduction of Exchange-Inert Metal Ions into Enzymes. D.S. Auld, Use of Chelating Agents to Inhibit Enzymes. Analytical Techniques. W. Slavin, Atomic Absorption Spectrometry. J.M. Harnley and D.L. Garland, Multielement Atomic Absorption Methods of Analysis. S. Chandra and G.H. Morrison, Ion Microscopy in Biology and Medicine. T.H. Risby, Flame Atomic Emission Spectrometry. K.A. Wolnik, Inductively Coupled Plasma-Emission Spectrometry. J.A. Olivares, Inductively Coupled Plasma-Mass Spectrometry. R.G. Michel, Atomic Fluorescence Spectrometry. J. Osteryoung, Electrochemical Methods of Analysis. J. Versieck, Neutron Activation Analysis. Analysis of Metals. J. Savory, S. Brown, R.L. Bertholf, N. Mendoza, and M.R. Wills, Aluminum. G.N. Bowers, Jr., and T.C. Rains, Measurement of Total Calcium in Biological Fluids: Flame Atomic Absorption Spectrometry. S.F. Sena and G.N. Bowers, Jr. , Measurement of Ionized Calcium in Biological Fluids: Ion-Selective Electrode Method. C. Veillon, Chromium. R. Shapiro and M.T. Martin, Determination of Cobalt by Atomic Absorption Spectrometry. M.A. Evenson, Measurement of Copper in Biological Samples by Flame or Electrothermal Atomic Absorption Spectrometry. W.W. Fish, Rapid Colorimetric Micromethod for the Quantitation of Complexed Iron in Biological Samples. M.T. Martin and R. Shapiro, Atomic Absorption Spectrometry of Magnesium. F.W. Sunderman, Jr., S.M. Hopfer, and M.C. Crisostomo, Nickel Analysis by Electrothermal Atomic Absorption Spectrometry. S.A. Lewis, Determination of Selenium in Biological Matrices. D.M. Martin and N.D. Chasteen, Vanadium. K.H. Falchuk, K.L. Hilt, and B.L. Vallee, Determination of Zinc in Biological Samples by Atomic Absorption Spectrometry. Author Index. Subject Index. @from:From the Preface Although it has been suspected since ancient times that metals participate in biological processes, details of the manner in which they might exert a function have until recently remained unknown. It is now appreciated that metals play roles in catalysis, hormone action, gene and other regulatory functions, structural stabilization of macromolecules, muscle contraction, nerve conduction, and transport. "Metallobiochemistry" is a field which has grown and matured rapidly over the past decade. Metalloenzymes have been the central investigating targets. 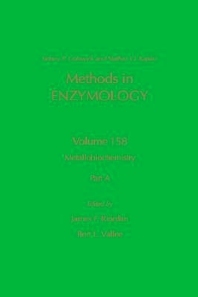 This volume provides both the emerging and practicing metallobiochemist with the necessary tools to answer what should be the number one and two questions: Is this enzyme a metalloenzyme? What metal is it?